firm of John Forbes & C Viz. on the East by the Said Sanjy CreekC- I---- 10 Arp. 7154 Arpb forward P7154 Arp. p. 23 bro forw 7154 Arp? & third to One quarter each, undivided, & as tenants in Common- isz. 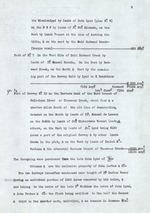 Sandy Creak, bounded on the N~eth (as it appears by Survey N.